Recently I needed to purchase a SCART to component cable. My local (actually across the street) big name electrical retailer was asking $180 ($150 if I bought it straight away). So onto Cable Chick and purchased a Pro Series 3m SCART to Component + L & R Audio Cable (Gold Connectors) for $29.95. I had to wait a few days, but it was worth the $120 saving! Output to DVI with this USB Type-C to DVI Cable Adapter! Revolutionary USB 3.1 Type-C interface with DVI video output for use with latest Type-C equipped MacBook and Google Chromebook + other upcoming devices! The latest 2016 release Macbook Pro has a strict 87W power requirement for connected USB Type-c devices running in alternate mode. 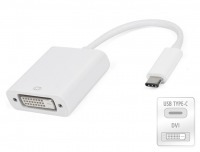 Therefore most available USB Type-C video adapter cables, including this Type-C to DVI cable, are not compatible wiith the latest MacBook Pro. PLEASE NOTE: This adapter is DVI-D Single Link so will be limited to a maximum resolution of 1920x1200 @ 60Hz. This USB Type-C to DVI Adapter lets you output perfect digital video DVI signals from your fancy new USB 3.1 Type-C equipped machine. Simply connect the Male Type-C plug to your computer's Type-C socket, then connect a DVI Cable of your preferred length. Take a look at our range of DVI cables avaialble. Excellent service, I usually get product from you in QLD before I can get them delivered locally. Keep up the good work.